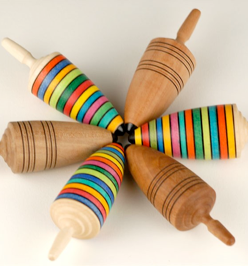 Toy spinning tops are designed to be spun rapidly on a flat surface.Traditionally tops were constructed of wood, sometimes with an iron tip. The top is one of the oldest recognizable toys found on archaeological sites. They are found in many different cultures all over the world. 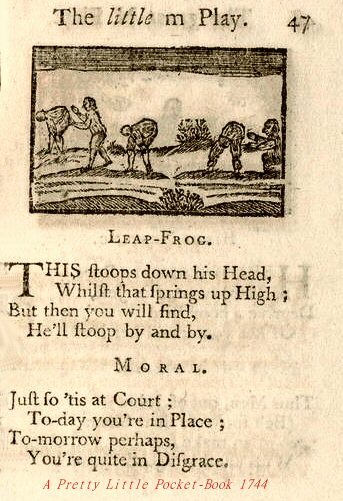 Besides toys, tops have also historically been used for gambling and prophecy. The action of a top relies on the gyroscopic effect for its operation. Typically the top will at first wobble until the shape of the tip and its interaction with the surface force it upright. 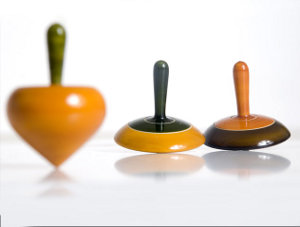 The body of a spinning top has at least one axis, known as a principle axis, around which it spins. They traditionally have a peg shape in which the top of the body is much wider than the bottom, or tip. Spinning tops also include a mechanism to begin the spinning such as a spring cap, stem, string or pump. They can be made of a variety of materials including wood, clay, stone and metal, and are typically brightly painted. Spinning tops come in many different sizes. A large top weighing around 15 lbs. was found in primitive Malay and most often used by adults. Drawings of large parish tops weighing up to 2 lbs. and reaching 8 inches tall have also been recovered. 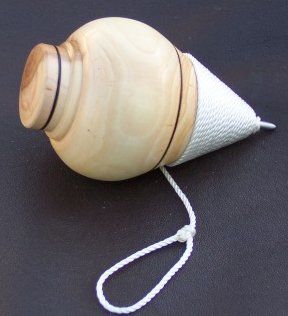 The throwing top is composed of a cord wrapped around the body of the cone shaped or peg top. Throwing tops are the most common type of top in the world today. Throwing and landing on the point of the top is very hard on the toy. Therefore, the lifespan of a typical throwing top is quite short. 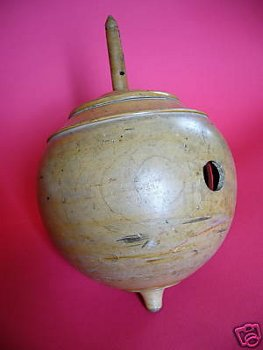 A common name for a throwing top is the “peg top.” The original peg tops were carved to a point rather than having the peg inserted into the body as is done today. The peg top is a skill building top, principally because of the throwing aspect. There are many more things that one can do with this top when one maintains personal control. Wood is the primary material used to make throw tops. As mentioned above, originally, the peg (point) itself was part of the top. Later, hard woods or bone, and then metal points, were used; the metal driven or glued into the hole provided for that purpose. As pegs became smaller, thus reducing the friction between the top and the playing surface, both speed and spin time were improved. 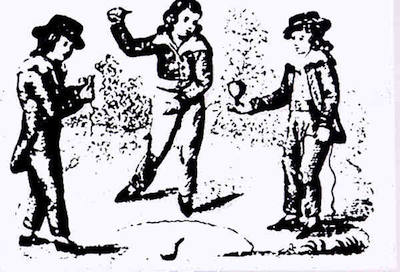 All sorts of games using throwing tops were invented and are still being played. Battle Top was one such game where two or more tops try to knock one another out.￼ Throwing tops with nail points, could be used in top fighting. 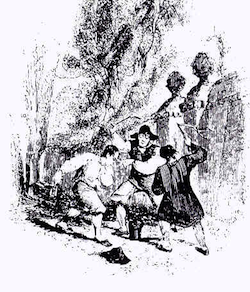 Players would attempt to hit their opponent’s top with the intent of splitting it in two. Twist tops are generally defined as those tops which are set in motion traditionally using three fingers. These sorts of tops are the most straightforward, lowest “tech” versions of this ancient toy. Records involving twist tops usually have to do with longest spin times, and the number of tops that can be set spinning in a given period. Not all humming tops depend on a gyroscope mechanism. The antique top pictured here (and on display at the Whistle Museum, Vicenza, Italy) works as a function of a twisting motion. Forms of whip tops were found in Egypt as early as 2000 B.C. and China from 1250 B.C., formal written record of whip tops are recorded as early as 1344 A.D. (Roman d’Alexandre) and more commonly in the 18th and 19th centuries. Distribution of the whip top appears to be worldwide, as examples are found in Europe, the Americas, northeast Asia, the Pacific Islands, India and Africa. Many sources give China credit for the invention of the whip top, which was then brought to Europe by seaman who had seen them on their travels and which was noted in 14th century European manuscripts. Though again, it appears that these tops were developed in other places of the world as well, such as Egypt. This concurrent development of different types of tops is proven by studying current day primitive tribes, as the same items are developed without knowledge of their existence in advanced cultures. The whip top has mostly kept to the basic cone shape and was made of wood, fired clay and, in some cases, stone. During the 18th century, heavy whip tops of iron were made with the intent of whipping on the ice of ponds and lakes. The peg of the whip top was not stressed since the point did not have the wear from impact on it as with the peg top. Any imbalance in the top’s construction was also less important, as the constant whipping action seemed to offset its effect on the spin of the top. The social significance of the top is most apparent with the whip top. Top spinning was accepted for both sexes in classical Greece, as shown on the pottery carvings and paintings. In the Pacific Island and southeast Asian cultures, it was primarily a male sport, with fewer girls and women participating. Rarely girls and women played with tops in European cultures. Interestingly, the top was specifically identified as an acceptable form of play when stated on the “Orders, Statutes and Rules” in 1591 of the Harrow School in England, where it stated, “…The scholars shall not be permitted to play, except upon Thursday only sometimes when the weather is fine, and upon Saturday, or half-holidays after prayer. And their play shall be to drive the top, to toss a handball, to run, or to shoot, and none other.” (To shoot presumably meant in the form of archery.) The phrase “to drive a top” meant to play with a whip top, which certainly was an in expensive way of exercise. Of particular notice are whip tops and peg tops, as shown below on an early 19th century wood block print. In America, tops were king of the hill in terms of toys during the 18th and 19th centuries. D. W. Gould (1973). The Top. NY: Clarkson Potter. ISBN 0-517-50416-2. National Recreation Association (1965). Recreation. p. 92.